A nostalgic look at the day-to-day life of past decades flickered onscreen at the Mississauga Central Library Nov. 21, as the first Home Movie Day showed amateur films dating as far back as the 1920s. 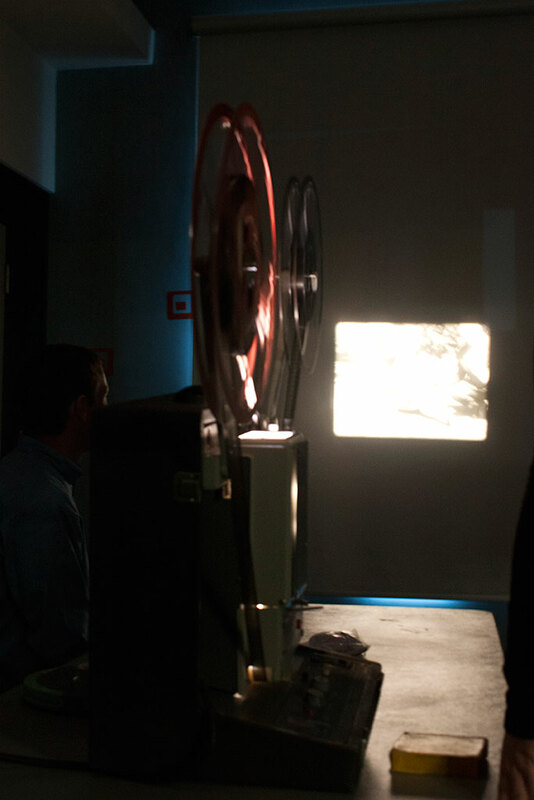 Tucked in a corner of the library, a handful of Sheridan film students and faculty screened 8mm and 16mm home movies using film projectors. “Home movies are a very specific type of narrative that captures personal history,” said Sean McNabney, associate dean of the Faculty of Humanities and Social Sciences. 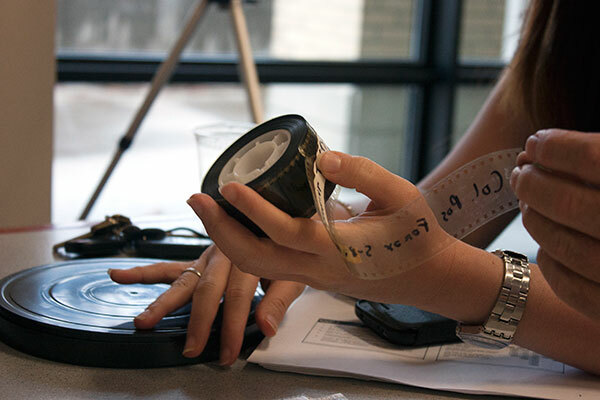 The Home Movie Day was sponsored by the Centre for Home Movies and co-presented by Sheridan’s Faculty of Humanities and Social Sciences and the Mississauga Library. The films gave a glimpse of what life was like in the ‘20s thru ‘60s, highlighting both the similarities and differences between the past and present. Peter Steven, a professor of Film Studies at Sheridan, says home movies from the past can give a candid look at the history and culture of life back then. “What’s unusual to some degree about these films is how everyday they are. These are not special events, just kids and mom,” said Steven. 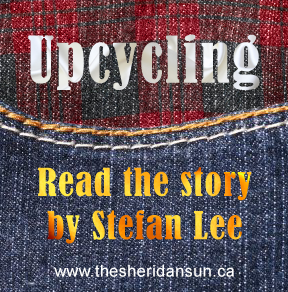 One of the home videos he showed was his wife’s childhood in Nova Scotia during the ‘50s and ‘60s, which was filled with days spent playing with dogs, playing in the snow and at home. His wife’s mother shot the video while her father was away at sea in the navy. Mothers usually filmed everyday events while fathers typically recorded big events such as birthdays, said Steven. The small crowd silently enjoyed the movies, smiling and laughing at certain parts, while the film reel clicked in the background. First year Bachelor of Film and Television student Elaine Archambeau appreciated the simplicity of the home movies. Archambeau also liked the time period of the films and the vivid and saturated colours. 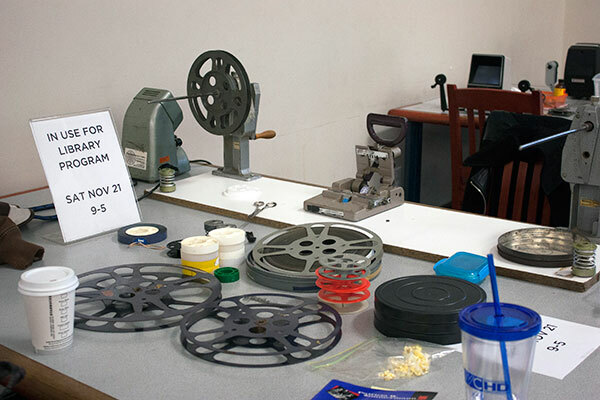 John Kneller, a professor in the Film and Television program, was behind the technical aspects, teaching the students on how to use film, set up the reels on the projector and screen them as part of their co-curricular activities. Kneller brought a late 1920s home movie given to him by his next-door neighbour’s grandfather, which showed the different fashions of that era but also how certain activities, such as playing golf with family, have persisted through decades. He also showed a short film from 1922 called Frogland by Wladyslaw Starewicz, one of the first stop-motion films created. The event was part of the Film for Thought series, a “creativity initiative started last year as a celebration of film in relation to community-centred ideas,” said McNabney. “Part of our role is to interface with the community in a way that educates them about what we specialize in, and the appreciation of film,” he said. 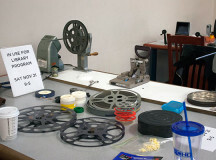 Tables filled with film reels and equipment were set up in the Mississauga Central Library. 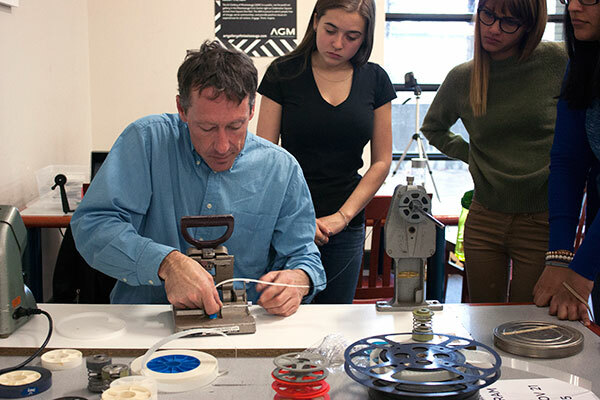 John Kneller, a professor in Sheridan's Bachelor of Film and Television program, demonstrates to students how to splice strips of film together. A roll of 35mm film means better quality. This type of film was originally used by Thomas Edison and soon became the industry standard. 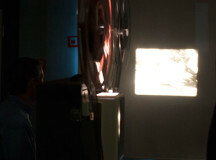 A 16mm movie projector shows a home movie from the 1920s. The 16mm was the standard for amateur videos. Added by janagregorio on November 24, 2015.